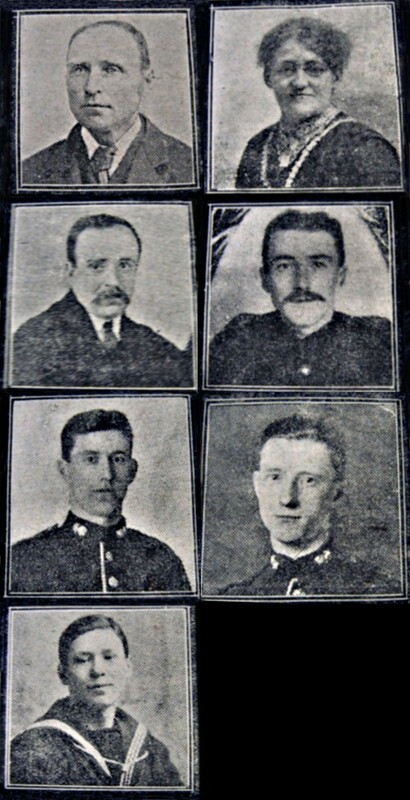 Portraits of Mr and Mrs I Williams, of Church Lane, Quorn, and their five sons, most of whom have served in the forces since the outbreak of war. Third row: Machine Gunner Benjamin Rue Williams, Northumberland Fusiliers, born 1892, wounded four times on all British fronts, now in France. Pte Franklin Israel J Williams, born 1895, wounded 1915, now discharged. Israel and Frances Williams lived at 7 Church Lane (now demolished), with their five sons and one daughter.